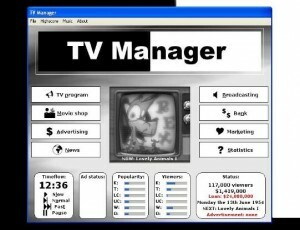 In the tycoon game TV Manager anyone should be able to achieve success with skill and hard work – the American dream. Live this dream by taking charge of a small and nearly bankrupt TV station and leading it to glory as the world’s biggest TV network. Place movies and advertising spots in your program depending on which audience segment you wish to appeal to. Create your news programmes by mixing ingredients that will appeal to your audience segment – sports, national news, lifestyle… your choice.